Revision activity for Science unit 4 - Family (2nd grade). 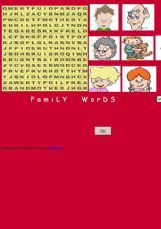 It was prepared to practise simple family vocabulary and easy pronouns exercises. 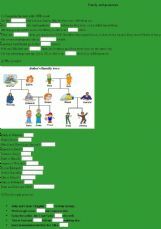 Look at the family tree. 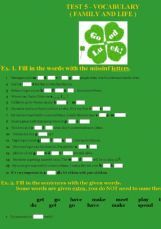 Then fill in the blanks with the correct family word. Students have to find the hidden words. 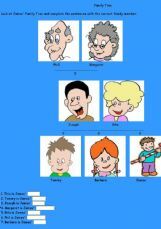 Students get to identify the different family members while looking at James� family tree. 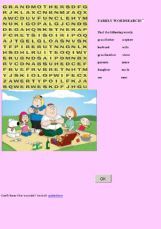 IT�S A VERY NICE CROSSWORD FOR KIDS. 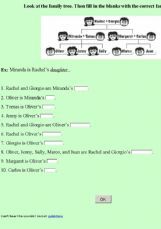 This test is designed for students who are preparing to take some test.The exercises are on FAMILY topic. AN OE ABOUT THE TOPIC: FAMILY. 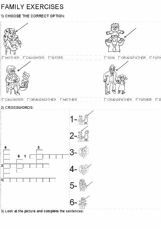 exercises: gap filling + multiple choice + wordsearch.